The acceptance of coupons has become commonplace for many retailers. To improve efficiency and accuracy, UPC barcode symbols are included on the face of the coupon. The information below discusses the most common symbol used by many world-wide retailers. The GS1-128 barcode was used on coupons from 1997-2008. 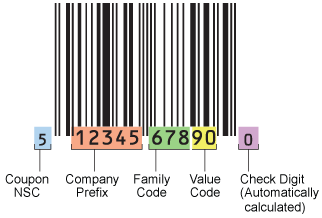 For a variety of reasons, the barcodes for coupons have altered to the GS1 Databar language. In addition to the primary UPC coupon code, the FMI/GMA Coupon Scanning Subcommittee of the Joint Industry Coupon Committee has develop an additional bar code symbol to encode other important information. 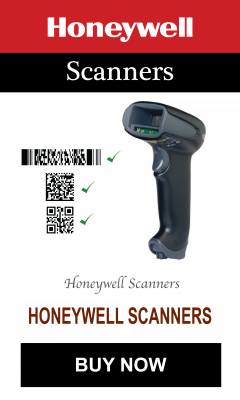 The presence of the extended code will not affect the scanning importance of the UPC coupon code on current POS Systems. 1. Number System Character (NSC) of 5 Most POS UPC symbols on products begin with either 0,3,6,7,8,1 however regardless of the NSC used for the individual products, all coupons should have a NSC of 5. 2. GS1 Company Prefix The Five digit Company Prefix will be identical to the Company Prefix on the product itself. 3. Family Code The next three digits after the company prefix are the family code. The manufacturer assigns family codes to each of their products. This three digit number is completely different from the product number used on an item, since many coupons are redeemable on more than one size, color, or form of particular branded product. The family code is the key to validating that a consumer has purchased the couponed product. 4. Value Code The value code identifies the redemption value of the coupon. This two digit field follows the 3 digit family code. The Value Code Table has recently been revised. Please click here to view a table of all value codes. 5. Check Digit The 12th digit of any UPC symbol is the check digit. This is a calculated number based on the eleven preceding digits. Bar Code Graphics, Inc. will always compute this number. It is common for the five digit offer code to be printed above the bar code symbol.